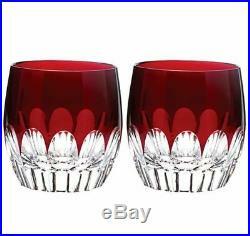 WATERFORD MIXOLOGY RED TALON DOUBLE OLD FASHIONED GLASS TUMBLER SET of 2 164059. The contemporary Mixology Talon Red tumbler glass. New shape, fresh, dynamic cutting. Beautifully highlighted by striking jewel tones of ruby red using an innovative, applied color technique. Hand-crafted by European master craftsmen with the weight, clarity and artistry for which Waterford has become world famous for. Set of 2, each glass stands approx. 3.5″ tall x 3″ top rim diameter. Tched with the “Waterford” hallmark. Acquisition or very special gift. BRAND NEW IN ORIGINAL WATERFORD BOX. Thank you for your support of my auctions as I have been dismissed from job due to work restrictions as a result of being physically assaulted by a patient. All proceeds from my auctions will be used to pay my home loan until I can get another job. Please check out my other auctions. Smoke Free and Pet free home. The item “WATERFORD MIXOLOGY RED TALON DOUBLE OLD FASHIONED GLASS TUMBLER SET/2 160459 NEW” is in sale since Thursday, May 24, 2018. This item is in the category “Pottery & Glass\Glass\Glassware\Waterford”. The seller is “beanice” and is located in Altoona, Wisconsin. This item can be shipped to United States, Canada, United Kingdom, Denmark, Romania, Slovakia, Bulgaria, Czech republic, Finland, Hungary, Latvia, Lithuania, Malta, Estonia, Australia, Greece, Portugal, Cyprus, Slovenia, Japan, China, Sweden, South Korea, Indonesia, Taiwan, South africa, Thailand, Belgium, France, Hong Kong, Ireland, Netherlands, Poland, Spain, Italy, Germany, Austria, Bahamas, Israel, Mexico, New Zealand, Philippines, Singapore, Switzerland, Norway, Saudi arabia, Ukraine, United arab emirates, Qatar, Kuwait, Bahrain, Croatia, Malaysia, Brazil, Chile, Colombia, Costa rica, Dominican republic, Panama, Trinidad and tobago, Guatemala, El salvador, Honduras, Jamaica, Antigua and barbuda, Aruba, Belize, Dominica, Grenada, Saint kitts and nevis, Saint lucia, Montserrat, Turks and caicos islands, Barbados, Bangladesh, Bermuda, Brunei darussalam, Bolivia, Ecuador, Egypt, French guiana, Guernsey, Gibraltar, Guadeloupe, Iceland, Jersey, Jordan, Cambodia, Cayman islands, Liechtenstein, Sri lanka, Luxembourg, Monaco, Macao, Martinique, Maldives, Nicaragua, Oman, Peru, Pakistan, Paraguay, Reunion, Viet nam, Uruguay.